For those looking for the best financial analysis ratios in the business, you've come to the right place. Don't take our word for it, big 4 accounting firm, Ernst & Young, proves the material superiority of our NOPAT. We give you the financial due diligence needed to fulfill the Fiduciary Duty of Care. Return on invested capital (ROIC) is not only the most intuitive measure of corporate performance, but it is also the best. It measures how much profit a company generates for every dollar invested in the company. It is the true measure of a company’s cash on cash returns. As we demonstrate in “ROIC: The Paradigm For Linking Corporate Performance To Valuation”, ROIC is the primary driver of stock prices. Growth and duration of profit growth also help drive stock prices, but ROIC is, by far, the most important driver because the market cares most about assigning value to the companies that produce the most cash per capital invested in them. If the opposite were true, the market would quickly go bankrupt. If you believe in any sort of efficiency in the stock market, ROIC is preeminent. The formula (see Figure 1) for calculating ROIC is easy. The hard part is finding all the data, especially from the footnotes and MD&A, required to get NOPAT and Invested Capital right. When we calculate ROIC, we make numerous adjustments to close accounting loopholes and ensure apples-to-apples comparability across thousands of companies. “If ROIC Is So Great, Why Isn’t Everyone Using It?” The short answer is twofold: (1) most research comes from sell side firms whose underwriting businesses are not aligned with exposing the true profitability of companies and (2) it is a lot of work. As an independent firm, we have no conflicts with our clients. Our cutting-edge technology to analyze footnotes enables us to scale our unique ROIC model building expertise. We make it easy for the average investor to leverage the benefits of a high quality ROIC model. As our research continues to proliferate, it gets harder for investors and executives to overlook its merits. Figure 2 shows the companies with the highest and lowest ROIC out of 3000+ companies under coverage. Apple’s 254% ROIC is the highest of all companies under coverage. We’ve previously covered reasons we feel such a high ROIC is not sustainable. In fact, since 2011, Apple’s ROIC has fallen from 339%. 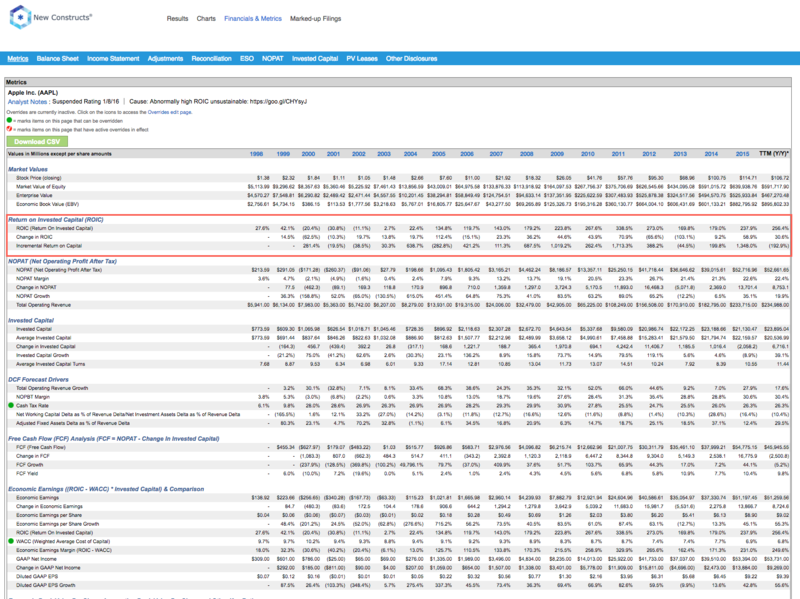 See Apple’s ROIC each year dating back to 1998 here. Veeva Systems (VEEV), Check Point Software Technologies (CHKP), New Oriental Education & Technology (EDU), and Ubiquiti Networks (UBNT) earn the second through fifth highest ROIC. However, ROIC alone doesn’t mean a company is a good investment. On one hand, Check Point Software was highlighted as a Long Idea in June 2015. Meanwhile, Veeva Systems earns an Unattractive rating due to misleading earnings and a high valuation. 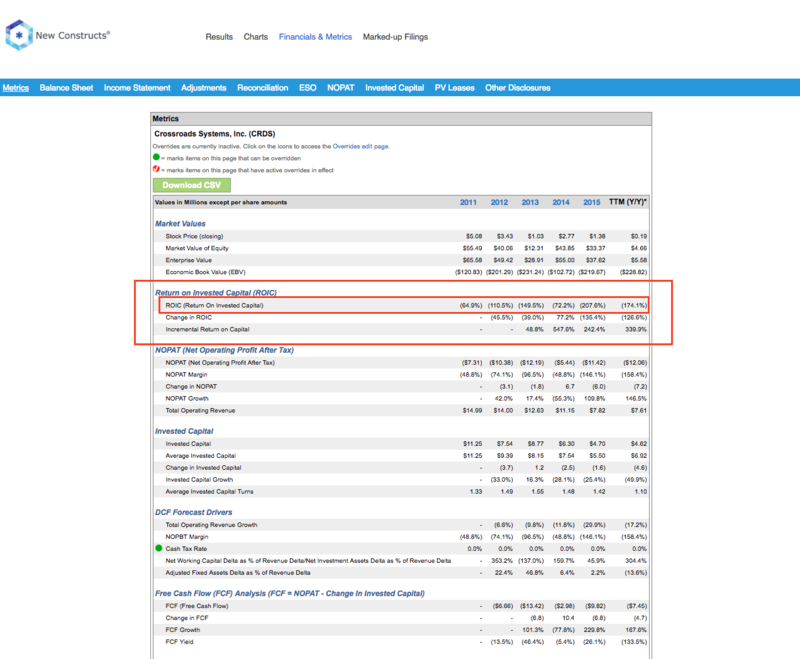 Here’s the Adjustment Page from our model, which shows exactly how we adjust Checkpoint’s GAAP net income to calculate NOPAT, the numerator in our ROIC calculation. 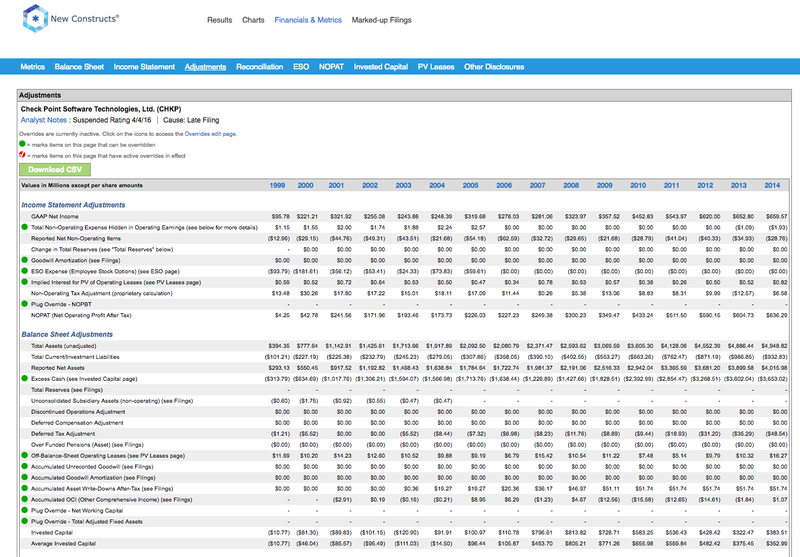 We also show how to convert total assets to Invested Capital, the denominator in our ROIC calculation. 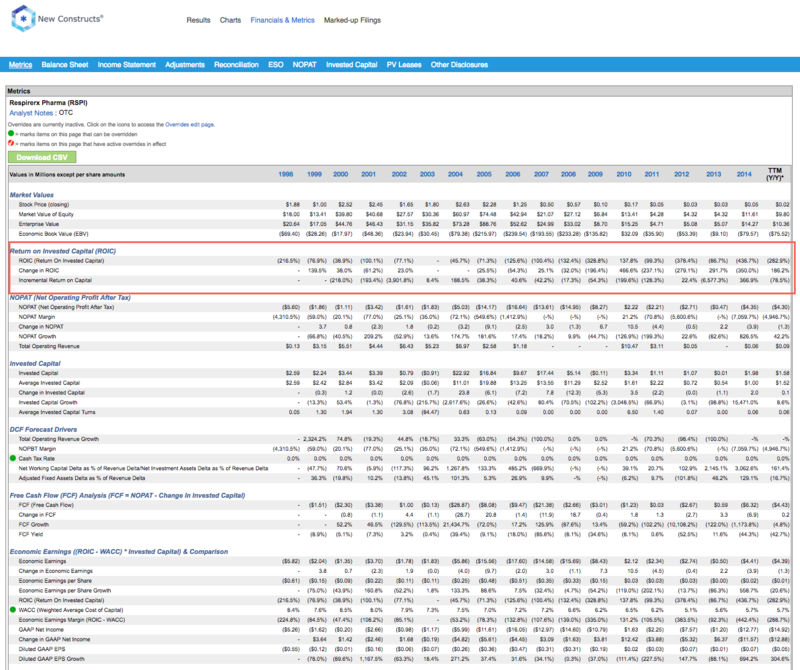 Respirerx Pharma (RSPI) earns the lowest ROIC of all companies under coverage. 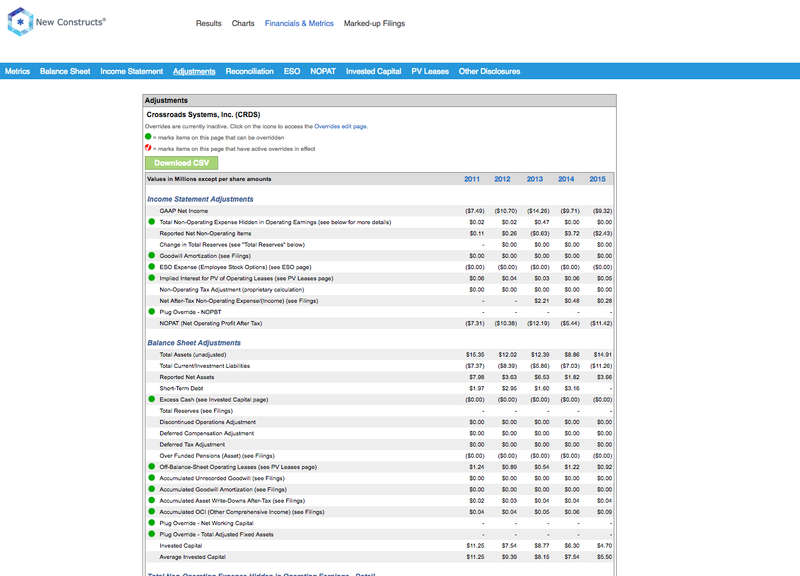 See RSPI’s ROIC for each year since 1998 here. Over the past decade, RSPI has earned a positive ROIC only once, in 2010. MabVax Therapeutics (MBVX), Anthera Pharmaceuticals (ANTH), Crossroads Systems (CRDS), and TherapeuticsMD (TXMD) round out the five lowest ROICs across 3000+ companies under coverage. See the adjustments page from our model of Crossroads Systems, where we show the adjustments to calculate NOPAT and invested capital. See CRDS’s ROIC throughout the company’s history here. Our models and calculations are 100% transparent because we want our clients to know how much work we do to ensure we give them the best earnings quality and valuation models in the business. Ernst & Young proves the material superiority of our measure of ROIC.